We make it easy to repair your wet crawl space by providing a free inspection and estimate. 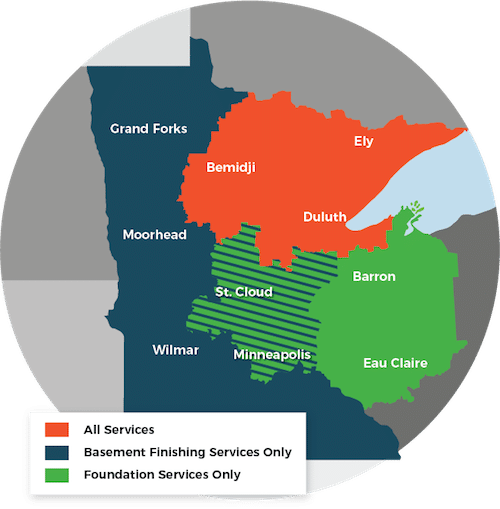 As Duluth Superior Area's trusted waterproofing contractor, we serve Superior, Duluth, Minneapolis and the surrounding area. Ready to get started on your crawl space moisture barrier? We have professional installers fully trained and certified to deliver results you can rely on. DBS services Two Harbors, Cloquet, St. Paul, Hermantown, Virginia, Ashland, Esko and many nearby areas in Minnesota and Wisconsin. Contact us today for a free estimate!